If you are looking for a children’s dentist in Orlando, perhaps by typing something like “dentist near me” or “family dentist Orlando” into your smartphone so the oracle known as Google can solve another one of life’s mysteries, we have some news for you. The news is that you are in luck, because your friendly adult and pediatric dentist of Orlando is here with affordable dental care for the entire family! We are so glad you are considering Your Downtown Dentistry for your family’s oral health needs. We aren’t just going to say that we have affordable dental care in Orlando without backing it up with some solid specials. If you are looking for an Orlando adult dentist, we have a New Patient Special For Adults at just $99. This offer includes the exam, X-rays, Oral Cancer Screening, and, of course, expert and careful teeth cleaning from Your Downtown Dentistry. We also have a New Patient Special for kids priced at an affordable $80! This includes the Exam, X-rays, Cleaning, a Topical Fluoride Treatment, and Oral Hygiene Instructions to help get your little guy or gal set up for oral health success down the road! Now that we’ve gotten some of the formalities out of the way (we would be remiss if we failed to inform our prospective patients about our first-visit specials), let’s move onto what we will be discussing in today’s post – myths about dental hygiene and going to the dentist! As is the case with many topics, there is a good deal of misinformation on this topic that can be found on the internet. We thought we would do our due diligence and “bust” a few of the more popular myths out there. So read on if you would like some practical information that might contribute to your oral health, or perhaps you just want a couple of random facts that might impress your friends, should the opportunity arise! This is a dangerous myth to believe, so don’t. While we are talking about family dentistry in Orlando, let’s talk about checkup recommendations for young children. It is absolutely untrue that children do not need to see the dentist until their adult teeth come in. While it is true that structural damage to baby teeth is “temporary”, it remains an obviously true statement to say that a child shouldn’t suffer through a cavity, a chipped tooth, an infection, or the like. Beyond that, decay and damage can adversely affect the long-term gum health, so there is another reason for you to use. The long and the short of it is simple: find a children’s dentist, and take your kids to the pediatric dentist as soon as you start to see their little baby teeth peak out! Contrary to this belief, bad breath is not a guarantee that you have gum disease. Although it should be said that having bad breath is sometimes an indicator that you have gum disease, it is one of many. 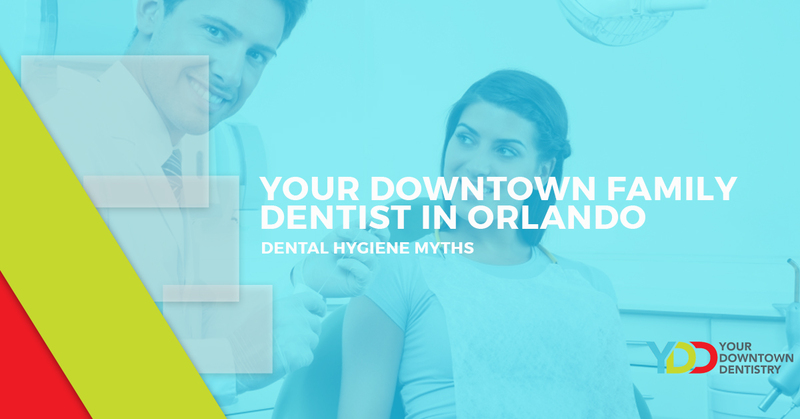 The only way that you can be sure about such a situation is if you go to see your friendly dentist in Orlando. We recommend ourselves (Your Downtown Dentistry), believe it or not. Bad breath could be coming from any number of places. It might be from a lack of flossing and teeth brushing or it could be a symptom of acid reflux. It might be something else, too. Consider talking to both your dentist and physician if you need to get to the root of the matter. Unless you are using an inordinate amount of over-the-counter teeth whitening products (like strips, pastes, or trays), it is highly unlikely that teeth whitening products will damage your enamel. This is because the active ingredients found in these products, such as hydrogen peroxide or carbamide peroxide, oxidize your teeth to remove stains only on the surface of your enamel. We should say that some develop a degree of tooth sensitivity when receiving teeth whitening treatment, but this is the exception more than the rule. As is the case with most things, moderation is key in this instance. Keep in mind that we at Your Downtown Dentistry have a variety of cosmetic dentistry treatments, which include teeth whitening, DURAthin Prepless Veneers, smile design, and more. If and when you come visit us for an exam and teeth cleaning, make sure you ask your dentist about our teeth whitening options! We aren’t quite sure who believes this, but we felt compelled to set the record straight nonetheless. Excluding extemporaneous circumstances, most dentists will recommend using a soft toothbrush if you are worried about brushing being harmful to your enamel or gums. Utilizing that approach will likely solve any sensitivity issues you might be having. We have a variety of dental services here at Your Downtown Dentistry. From professional teeth whitening, clear aligners as a braces alternative, veneers, oral surgery, preventative dentistry, restorative dentistry, gum treatment, to Botox treatment and beyond, we have you covered. We have a comprehensive lineup of dental services to aid Orlando community members in achieving their healthiest, most beautiful smile ever! From the time you set foot in our office, you’ll be treated with care and professionalism. We’ve made a point to create an environment where you can feel stress-free and relaxed while you receive the highest standards of dentistry care. Whether you are interested in a restorative, preventative, or cosmetic dentist, you can find your solution here at Your Downtown Dentistry. We have a passion for helping our clients get excited about the way their teeth could look and how healthy their teeth could be. We take the time to learn who you are and how we can help, so we can better align our tailored dentistry treatment plan with your needs and desires. But you shouldn’t just have to take our word for it. Check out this glowing, five-star testimonial Dawn was so kind to leave us on Google Reviews! As Dawn has attested, Dr. Behzadi and our staff do our best to make every single patient feel as cared for as possible. We are so pleased to hear how happy Dawn was with her experience getting dental veneers. If you are interested in finding a pediatric or adult dentist in Orlando who goes the extra mile, consider scheduling your appointment with us today. We would love to help you achieve your most beautiful smile!